Fresh produce is another reason I love summer time. Yep, that fruit bowl was my breakfast a few days ago! Aren’t the colors so beautiful!? Travis absolutely loves popsicles and feels they’re a quintessential summer treat. Basically, a food group if you ask his opinion. Travis used to be obsessed with those rainbow colored ice pops that you could buy in huge packs, but I refuse to buy them because they are mostly liquid food dye. I switched to buying fruit popsicles from the store but they still tasted artificial to me. I want to know exactly what’s in the food we’re eating so I started brainstorming ways to make our own pops. Last summer, I experimented a little bit with making our own popsicles and came up with simple watermelon juice popsicles that we both love! This summer, I wanted to try and re-create the ice pops that Travis always requests but with healthier ingredients. I always use coconut milk in our smoothies because it gives such a creamy and naturally sweet flavor, like in my all-time favorite body booster lemon pomegranate smoothie. It works just as well for the mango popsicles. 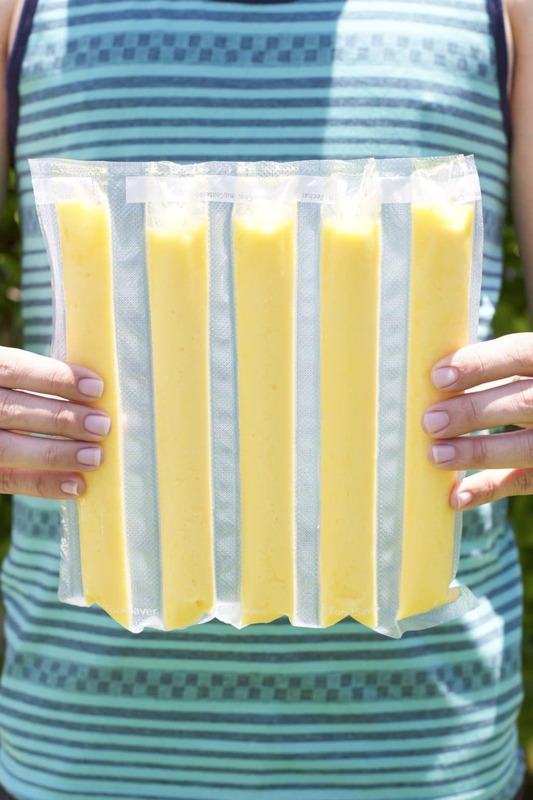 I didn’t want to make the mango popsicles in my popsicle mold because I wanted them to look like the ice pops, so I figured out a way to make them using my FoodSaver! I use my vacuum sealer so much that I finally just cleared a spot on my counter so I could leave it out all year round. I have a small kitchen and counter space is precious but it’s so worth it! I freeze everything. Anytime I find a good sale on produce or meat, I stock up and freeze 75% of it for the future, it’s such a money saver and so easy to use. The FoodSaver makes these popsicles so easy to make and convenient for Travis. He never really liked the cheap plastic popsicle molds that you can buy at the store because they don’t completely seal. He always complained that they would have a “freezer taste” to them. That doesn’t happen with the FoodSaver bags because thee pops are sealed from the air. 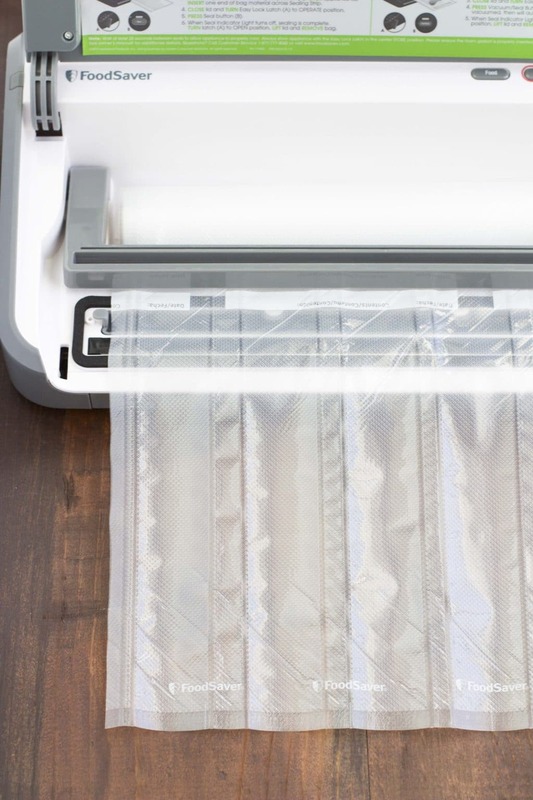 Step 1 – Put the roll of bags into the machine and line the edge up with the part that seals. Close the lid and hit the seal button. Step 2 – Measure 1 1/2 inches and seal again. Leave 1/2 inch gap between each popsicle so you have room to cut them apart. Repeat 5 times. After you make 5 molds, cut it off. Turn it sideways and cut off one side so you can fill it. Step 3 – Blend the frozen mango and coconut puree until smooth. Use a measuring cup with a spout to carefully pour the mixture into each mold. Make sure to leave 1 1/2-2 inches empty at the top so you have room to seal it. If you have trouble filling the molds, have someone hold the molds open for you while you pour until you get the hang of it. 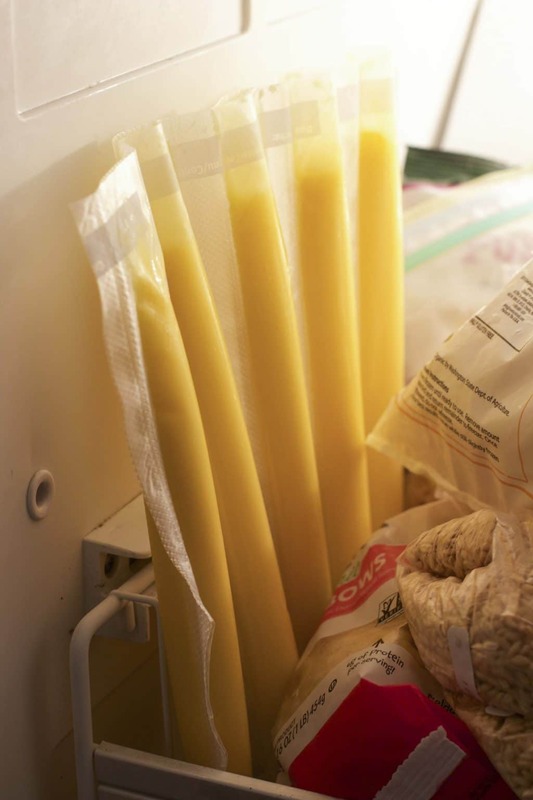 Step 4 – Carefully prop the popsicles up against a wall in the freezer to freeze for 1-2 hours. You just need them to be solid enough to not spill out when you lay them down in the FoodSaver to seal the top. You could fold the top down with a chip clip if youre nervous that it might fall over. Step 5 – Lay the pack down and seal the top. Put back in the freezer for 2-3 hours to finish freezing solid. Step 6 – Cut apart and enjoy! Make your own mango popsicles with only 2 wholesome ingredients! These popsicles are refined sugar-free and require only a few minutes to assemble using a FoodSaver vacuum. The perfect summer treat that everyone will love and you can feel good about eating! Add mango chunks and coconut milk to the blender and blend on high until smooth and creamy. Create the popsicle molds with a FoodSaver bags. Fill each mold with the mango filling. Freeze for 1-2 hours or until solid enough to lay down in the FoodSaver and seal the tops. Once sealed, put the popsicles back in the freezer for 2-3 hours to finish freezing the popsicles. You don't have to use mango, you can substitute with any frozen fruit. Note – You can make these mango popsicles any flavor! Just swap out the mango for your favorite fruit. 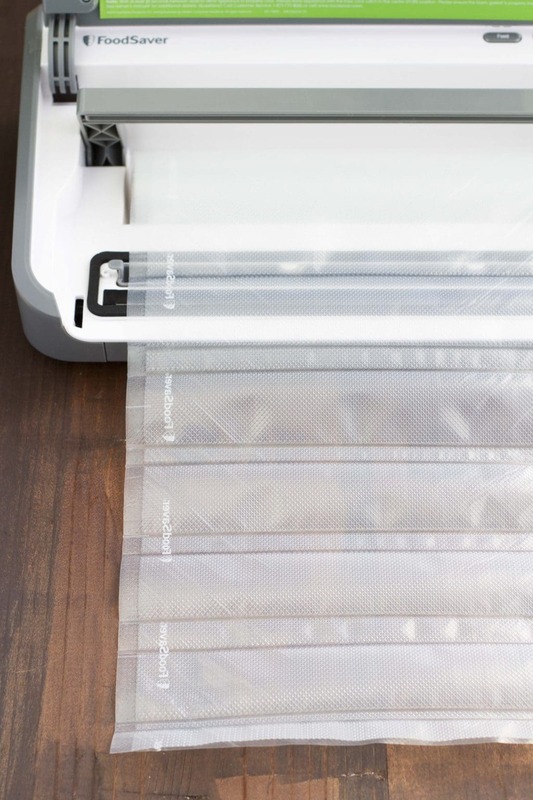 If you don’t have a vacuum sealer, no problem! 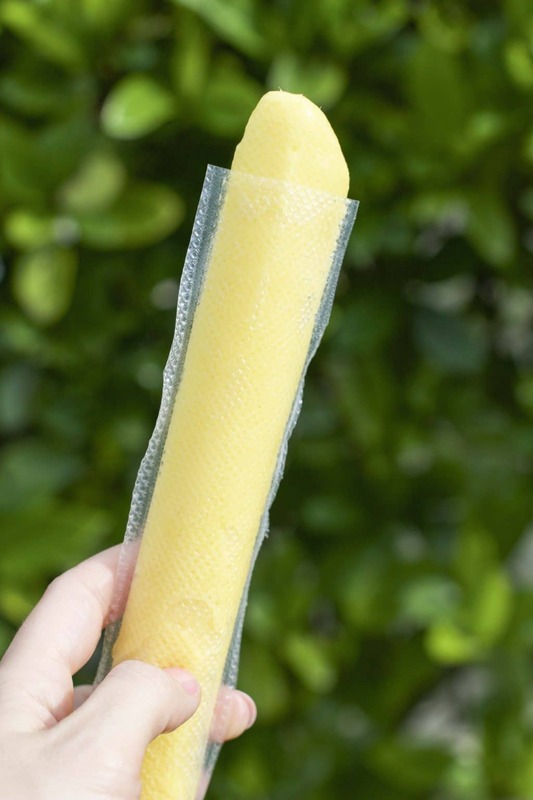 You can also make these popsicles with these handy dandy ice pop pouches. They are BPA free, and have a very convenient zip top so you can seal them as soon as you fill them up. You can also reuse them if you have the time to clean them out! I use these zip top pouches all the time too, they are so easy to grab and go! Travis and I both love these mango popsicles and he thinks they’re even better than the ice pops he used to crave! I made about 20 of these pops a few weeks ago and we’re already almost out, I swear he’s a bottomless pit! I’ll probably end up making another big batch to stash in the freezer to get us through the summer. I’m just glad that he’s eating a dessert that he loves and is full of healthy ingredients. I hope you and your kids enjoy these mango popsicles as much as we do! Have you tried making your own popsicles before? 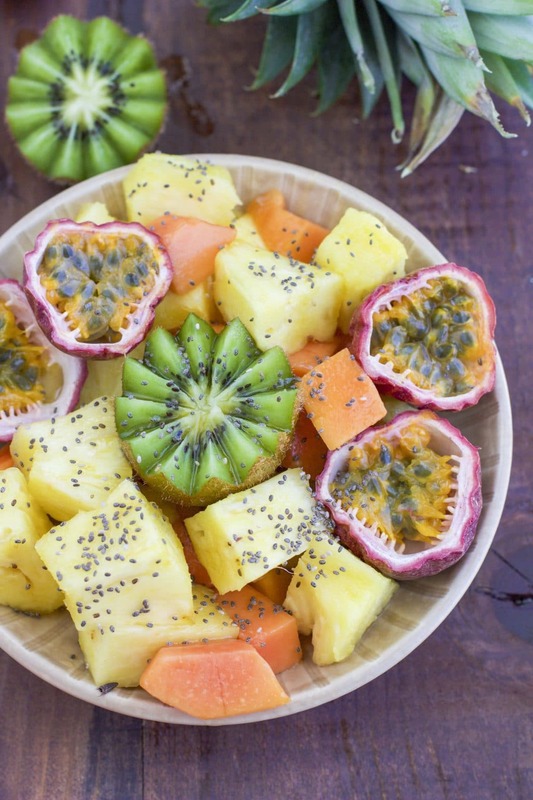 What’s your favorite fruit flavor? Let me know in the comments!